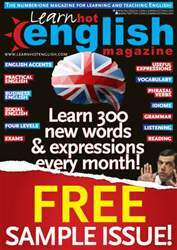 Digital Subscriptions > Learn Hot English > Sample issue Learn Hot English > The truth behind the magic! You’re going to read about a magician who did the following tricks: He has… walked on water, swallowed a necklace and retrieved it from his stomach, walked down a building, walked through glass, levitated at the side of a bus… How do you think he did these tricks? Make notes. Read the article again. Then, write a summary of how the author thinks Dynamo did each trick.